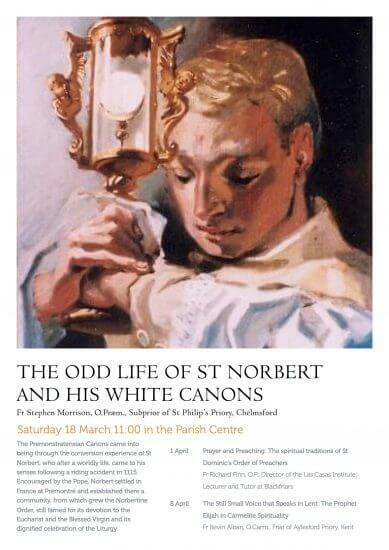 Our next speaker is Fr Stephen Morrison, O.Præm., Subprior of St Philip’s Priory, Chelmsford, on The Odd Life of St Norbert and his White Canons on Saturday 18th March. The Premonstratensian Canons came into being through the conversion experience of St Norbert, who after a worldly life, came to his senses following a riding accident in 1115. Encouraged by the Pope, Norbert settled in France at Prémontré and established there a community, from which grew the Norbertine Order, still famed for its devotion to the Eucharist and the Blessed Virgin and its dignified celebration of the Liturgy.